Today I’m going to present you Francie. She’s the first and only cousin of Barbie. She was released in 1965 and was produced for approx. 10 years. She disappeared around 1975. When she was available she was popular among young girls. 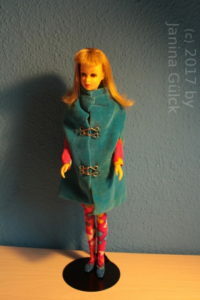 At first she was only available as Straight Leg doll (without knee joints) but in 1967 a Bend Leg version was available too. 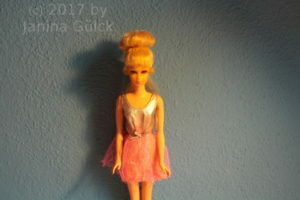 Francie has a different body than Barbie and she is smaller. She was originally called Francine Fairchild but she was sold under the name of “Francie” and was thought to be a 14 year old. The Francie dolls are popular among the collectors too. 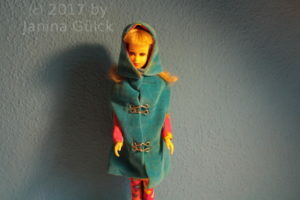 She was available in a wide variety of dolls like the two one I have in my collections. The “No Bangs” Francie is the most expensive doll. She has no bangs and giant hair do. I don’t have one yet in my collection but I really like her. She so late 1960s – stylish. Her wardrobe is very beautiful. Exiting outfits from the Mod-era (Mod-era 1966 – 1975) contribute to her popularity. The Growing Hair Francie was the only mechanism Francie doll. I was glad to get one last week. A long time ago Barbie clothes had names. The era started in 1959 and ended in the early 1970s. Until then every clothing ensemble had its own name. The names were sometimes funny, partially inspired by Hollywood and had a very high quality… a kind of Haute Couture in miniature. Today I’d like to show you two of my early (Vintage) outfits. The first one is a dark gray suit with a white shirt called Saturday Date. The red socks came in an extra Accessory Pak along with the red tie. Hey, we can be creative in this point. We can combine what we like. Why not a red tie and red socks for a date on Saturday in 1961? Have you noticed the tiny zipper on the pants? The next outfit is for Skipper. 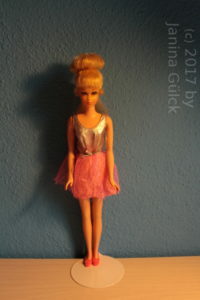 It’s called Sunny Pastels and was produced in 1965 for Skipper (Barbie’s younger sister, also available since 1965). 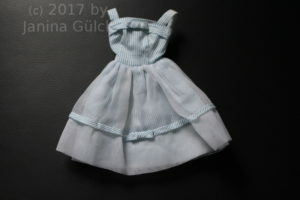 The dress is made of cotton and has a very high quality too. Although the outfit is 52 years old the colors are still vibrant. By the way it’s one of my personal favorite outfits. 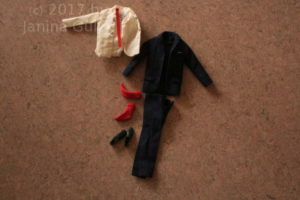 Behind the scenes I try to figure out how Vintage Barbie clothes (Vintage era from 1959 – 1966) were made. I’m especially interested the patterns for the fabric. 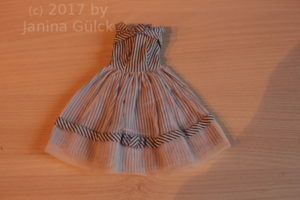 How can I turn a piece of fabric into a piece of clothing. I want to design own clothes in the Vintage style later but at first I have to understand how the patterns are made and the result I get when I follow sewing instructions. It’s not as easy as you might imagine. I have to deal with many different problems. 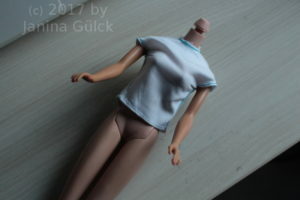 Especially the body forms of early Barbie dolls seem to be one of my main problems. At first I thought they were all the same size but they aren’t. Although they seem to be the same size they aren’t and that’s a big problem when you don’t know it. Then you can’t adjust the pattern to the body. For example that’s my result when I tried to sew a blouse. As you can see here the blouse seems to be to tight for the Midge/Bubblecut body I used here. Obviously the breasts are larger than it seems. 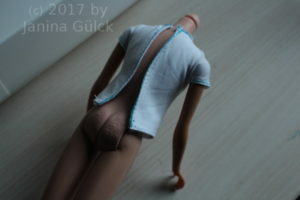 I haven’t really measured until now but fellow collectors told me that the first Ponytail Barbie bodies are smaller/ the measures are different. That’s very interesting and a good thing to know. By the way it’s no problem that the blouse is to tight. I thought that I might get problems like these. I made it just for reasons of learning. Last week I found a Vintage Movie Date dress. It might not sound very special but here’s the story why I write about the dress. 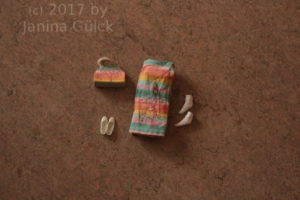 In summer 2017 I got a Vintage dress (Barbie Vintage era 1959 – 1966). I thought I had bought the Movie Date dress but in reality I hadn’t. I needed several months to find out that my dress without any label was made by Fab Lu. It got the name Cream Puff. The design of the Cream Puff is very similar to the Movie Date. 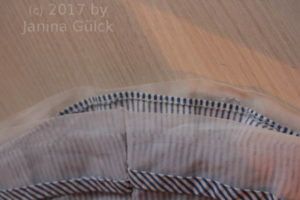 The only difference is in the processing of the seams, the wideness of the stripes and the colour of the stripes. and here you can see the difference of the seams… the Fab Lu seam is normal, not special but in comparison to this seam the Movie Date seam is very different but very Mattel-like. 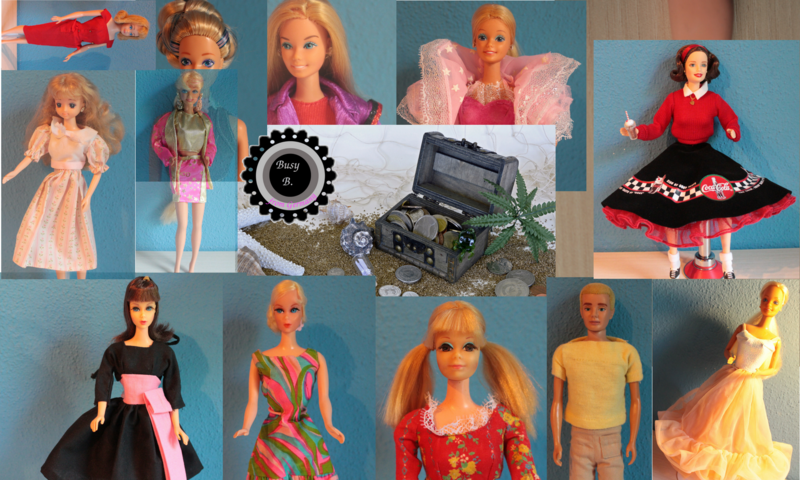 I have seen the Mattel seams in very different outfits but all in the same way done. At first sight and without both dresses it’s very hard to see the difference. That was my problem too. I hope I can help you with my information.